I spent a day in the DemoPit of the TechCrunch50 launch conference on behalf of my company Connectbeam. We didn’t debut at TC50 (two year-old company already has customers), but it was an opportunity to raise awareness among different communities. I’ll say this: DemoPit is like flying coach, while the folks on-stage are flying first class. You don’t get the amenities or attention, but you still get to travel. Here’s a quick summary of the experience. The tables are like 30 inches across. Not huge, but they were fine. Enough for a big display screen, a sign and a laptop. And that chip tip jar. Absolutely awful. The wifi was spotty early in the morning. Then it went down for several hours. That’s right…several hours. A bunch web-based companies without Internet access. Brilliant. Jason Goldberg of SocialMedian went out for an EDVO card at the local Best Buy. He was back in business, so my colleague went out for one too. After an initial blue screen of death, we had Internet access again. Late in the day, a TechCrunch staffer came by to offer another day to do demos since we had it pretty rough. Cool that they acknowledged the issue, and came up with a solution. Enjoyed myself when I could show off the product. It was great to take real-live data from someone visiting, punch it in the app and have it do all the cools things I said it could. A lot of guys hitting the DemoPit on Tuesday and Wednesday came through the area on Monday. Smart. They wanted to see how we pitched, and find out what to watch out for (uh..the wifi). Later this entourage-like crowd of people came through the DemoPit. It was Ashton Kutcher and Jason Calacanis’s were walking Jason’s bulldogs. There were several people accompanying them. Quite the scene. And still later, Sarah Lacy was interviewing Kutcher. Do you think he got Zuckerberg’d? I had a couple unplanned FriendFeed meet-ups, which was really cool. 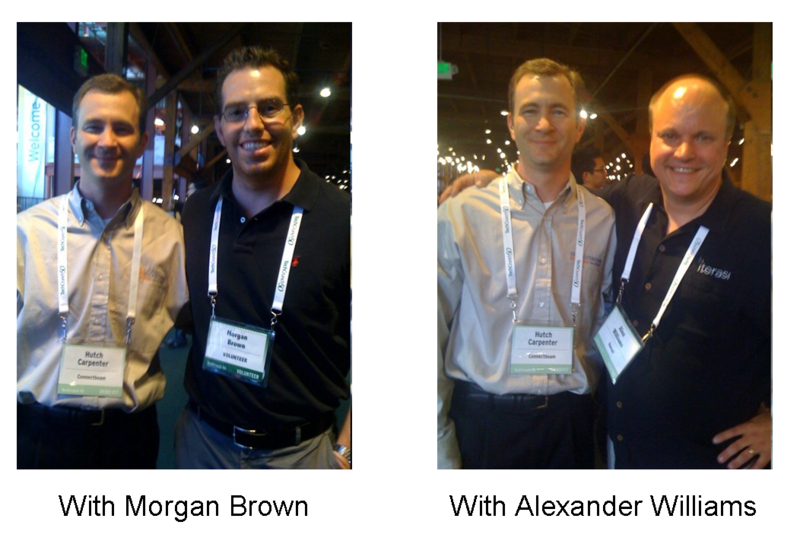 Saw a few weblebrities: Michael Arrington, Robert Scoble, Stowe Boyd, Jason Calacanis, Dan Farber, Loren Feldman. Three big communities were out in the DemoPit: Yahoo, Salesforce, MySpace. Jason’s Social Median table had a steady flow of traffic during the day. And he did well with those DemoPit chips. People give poker chips to companies whose products they like. The company with the most chips gets to go on-stage at TechCrunch50 on Wednesday. Social Media had a pretty good haul. Hope Jason makes it on-stage Wednesday. I liked TechCrunch50 participant Yammer. Enterprise Twitter. TechCrunch50 was tiring but fun. I enjoyed the scene. Next, Connectbeam will be at the KMWorld Expo September 23. And Defrag after that.